SON OF FANTOOM MATED TO HIS SUPER DAUGHTER! Everyone this is the Very Best I can offer to compete Against the Very Best in Large Competition This Male is loaded with vitality and alertness and his pedigree is all performance and loaded with Foundation breeders! Protege 73 is absolutely the only youngster to be offered from this Special pair in 2017. 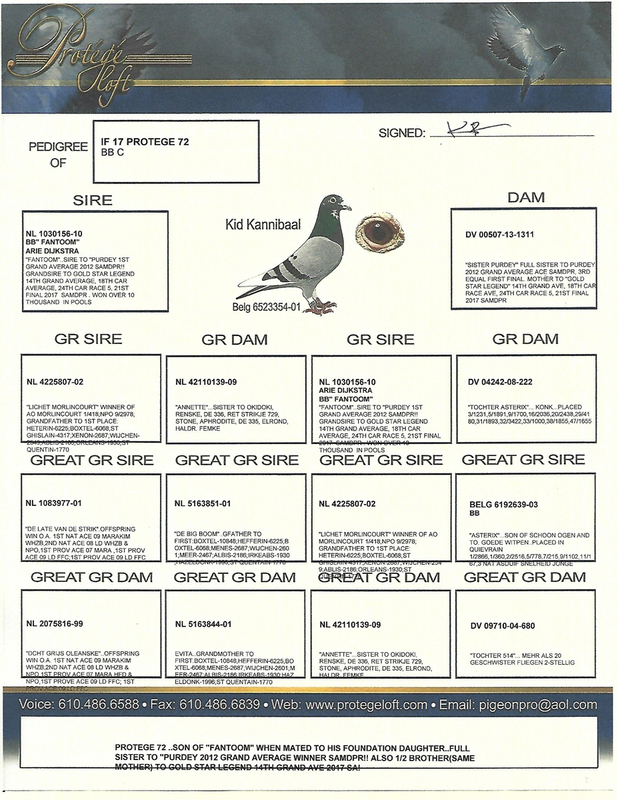 His Sire is "FANTOOM" NL 1030156-10.... Sire to World Famous "Purdey" The 2013 Sensation at the South African Million Dollar Pigeon Race!! Winning First Overall Grand Average And 3rd Equal First on a 3 bird Drop in the Final! 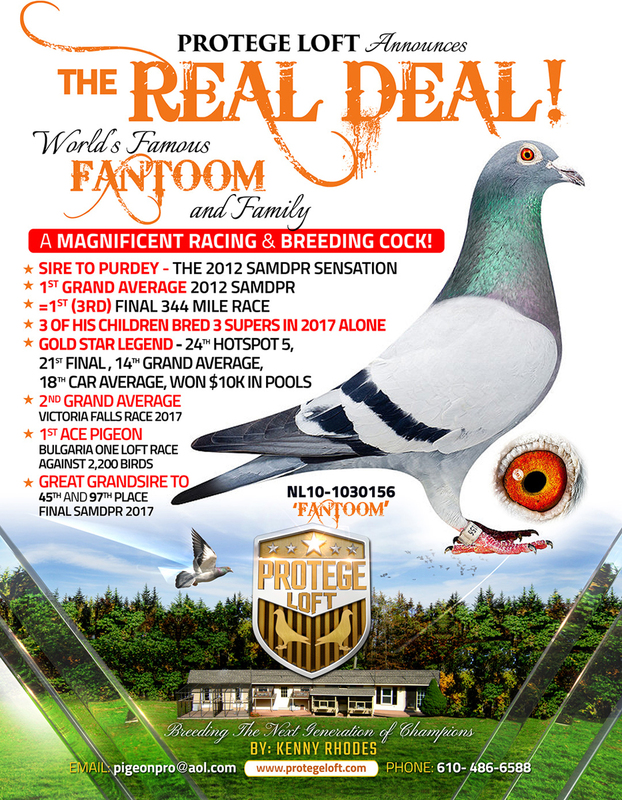 "FANTOOM" Is noted as a Super Breeder in 2017 Alone 4 different children bred Big Winners in One Loft Races around The World including "Gold Star Legend" 19th Car Race 1..76th Car Race 2...35th Car Race 3 And! 24th Car Race 5..21st in the Final..18th Car average..14th Overall Grand Average Ace against The Best Flyers in The World! Also the Second Overall Grand Ace at The Victoria Falls One Loft Race in Zimbabwe along with First Overall Ace at Sofia Bulgarian One Loft Race verses 2200 birds! Yes I would say he us a Super one for sure. Also in 2017 he the Grandsire to 45th and 97th in the Final Race at the South Africa Million Dollar Pigeon Race noted as the Best Race in The World with fanciers from 35 countries competing for Prestige and Fame. The mother to Protege 72 is "SISTER PURDEY" DV 00507 13 1311 the Super daughter of "Fantoom' And Mother to "GOLD STAR LEGEND" 24th Car Race 5, 21st in The Final, 18th in the Car Race Averages, 14th Overall Grand Average along with 19th,35th,76th in 3 other Car Races in the 2017 SAMDPR. 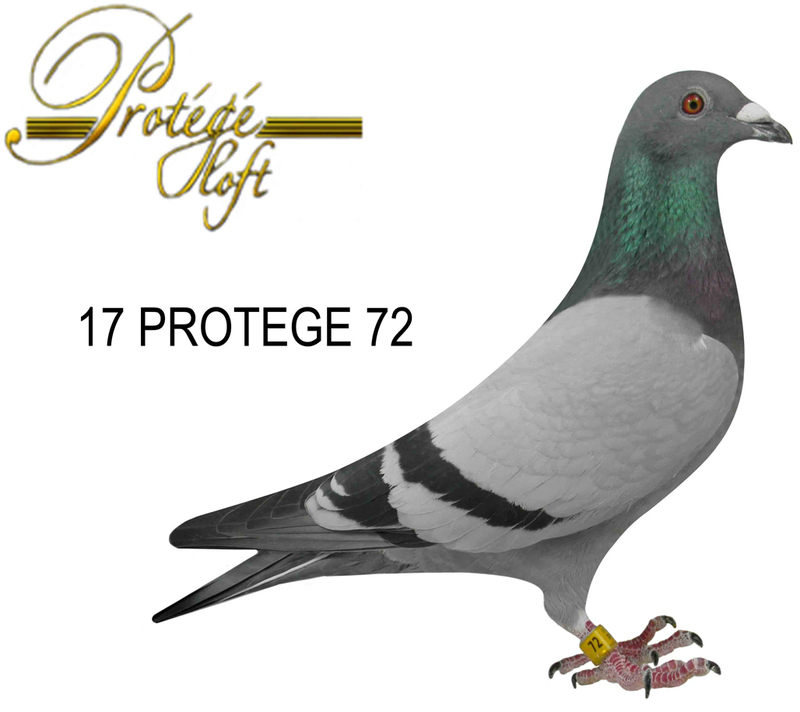 As Stated above I feel that Protege 72 is The Very Best to fly in the African Heat Against Large competition. He's also a Half Brother to "Gold Star Legend"! These birds are from a Family of Proven Winners in Africa. No One Hit Wonders here.